ISA, fish farms, inaction, etc. I’m getting in a letter-writing mood again. Here’s today’s missive, sent to the federal Minister of Fisheries and Oceans via the Wilderness Committee‘s convenient letter-writing tool (in case you want to write one yourself). I can’t resist picking up little bits of paper with writing on them. Being a compulsive list-jotter myself, I just have to know what people consider significant enough to commit to paper. Usually it’s disappointing, but occasionally i happen upon a gem. As a teen, i spent a year living with my grandmother in Winnipeg. I sometimes used to write messages on bits of paper and drop them strategically on downtown sidewalks, sometimes with a phone number, to see if anybody would call back. They never did. I would have. This intriguing list at right i just picked up on the sidewalk by the Co-op parking lot. 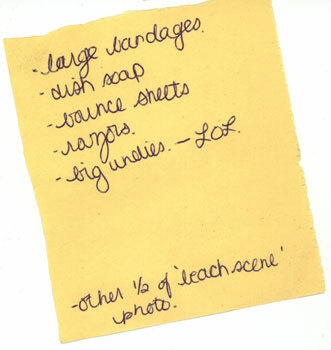 I like the “big undies — LOL,” and have to wonder why the “beach scene” photo got cut in half. I was on the way to the office, incidentally, to check my email to see what time tonight’s party started. Turns out the party isn’t for two weeks — something i’d have known if i’d listed it in my daybook. Acceptance – “It’s going to be okay.”; “I can’t fight it, I may as well prepare for it. Seems to me that list applies to much more in life than just terminal illness. A few things come to mind. That was a grim article (Salmon crisis on West Coast), on the slide of our West Coast salmon runs into extinction. For the people who are, on paper, supposed to be dealing with this — various DFO and governmental bureaucrats — it must be something of an embarrasment. For those of us who live here in Clayoquot and Barkley Sounds, however, it’s a little more personal. Salmon is the phenomenon that has made human life possible on the West Coast for several thousand years, sustaining us along with (directly and indirectly) the whole temperate rainforest and all of its denizens. That I should be living here at the time when this huge, ocean-spanning “resource” declines precipitously into extinction … well, that makes me feel deeply ashamed. I have come to expect nothing more than lip service on these matters from my federal and provincial governments, whose aims these days, it seems, are strictly economic, coddling everything job- and profit-creating at the expense of the troublesome natural world. But it is time, and well past time, for vigorous action on this front. What we’ll get instead, I expect, is arm-waving: “Oh, we don’t know exatly what’s causing the decline.” But if we wait for sciencific “proof” before we act, we might as well just go poison all those salmon streams ourselves right now. There is a growing body of evidence that fish farming is implicated in the decline of wild salmon. It happened in Norway, where every fjord that harbours fish farms is now devoid of wild salmon. It has been well documented in the Broughton Archipelago by researcher Alexandra Morton, who is now in the courts forcing the federal government to live up to its legal responsibility. And it has been happening here in the West Coast for years — more industrial fish farms, fewer wild salmon — during which little has been done. It is time to invoke the precautionary principle, which mandates erring on the side of caution when dealing with permanent extinction. At the very least, fallow the Clayoquot Sound fish farms during the period when smolts are running past them to the sea, which should ameliorate the sea-lice infection problem. In the meantime, we must get onto the science to better understand what is happening. And we must fund hatcheries as a stopgap measure. This is not like the forest, where if an old-growth area is logged, at least a semblance of what was once there eventually grows back. This is extinction — no salmon in those areas ever again. I no longer expect my governments to act out of a sense of responsibility anymore, even when it means enforcing their own laws. But it is no longer acceptable to me to stand by while they dither as our wild salmon die. I dearly hope my fellow West Coast residents not only feel the same way, but will call and write their elected representatives to express their concerns.